I’ve declared my projects for the Ravellenic Games. I’ll post a before-photo of the scarf for proof of progress. 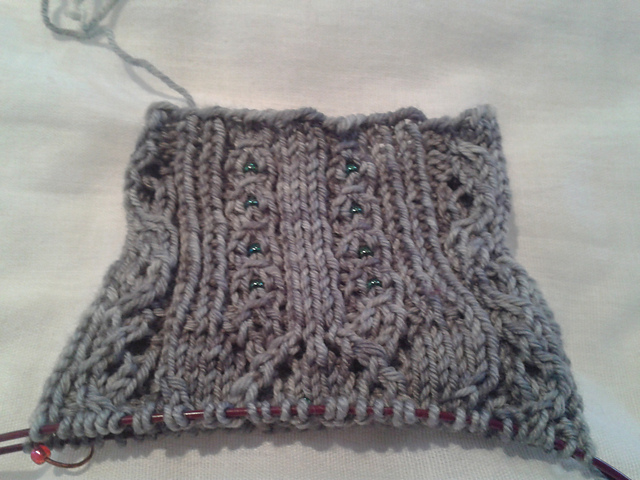 Must get on with winding the silk for the cowl before Friday. 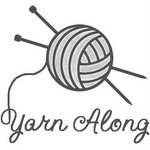 This week I’ve had a horrible bout of tonsillitis that left me off work and too sick to knit. As I started to recover, I wanted to knit something very simple so I started this scarf – the Doughnut Scarf. The yarns are all Colinette, from my trip to their factory shop last summer. The tabs on the bottom are various scraps of Hullaballoo yarn and the main body of the scarf is in Art, a lovely yarn with some bamboo content. I’m enjoying the complete lack of challenge, although I got bored yesterday evening so stopped. For some reason I am using straights – most unusual, although I’m quite enjoying it. The book is one of my current library books – The Campus Trilogy by David Lodge. Having grown up living on a university campus, I love books set in similar environments. This one so far is quite good: the story of an academic exchange between a UK academic at the University of Rummidge and a US professor at Euphoria University. It is quite densely written, but clever. The academics have just found themselves simultaneously in strip clubs on opposite sides of the world. I await developments with interest. Things have been getting very busy here as we head towards the end of term. My boss has been away a lot (and is in fact leaving soon, but that is another story), so it is my phone that seems to be taking up the slack and ringing off the hook. Of course, it is usually one of those recorded messages about PPI or compensation, but there are a fair few work calls as well. This would all be fine except that the baby has chosen this week to surprise us daily with her sleeping and waking pattern, plus we are all fighting off a bug of some sort. Anyway, my knitting time has mostly been diverted into extra sleeping, so things are moving quite slowly. Here are the beaded socks I’m working on. 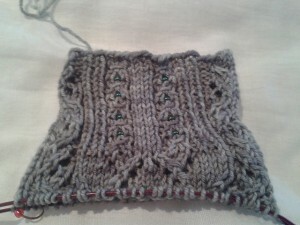 I’m a bit further on than this now – just a few rows left on the second leg. The pattern is Stardust by Adrienne Fong and these are the Stage 3 socks of Tour de Sock. 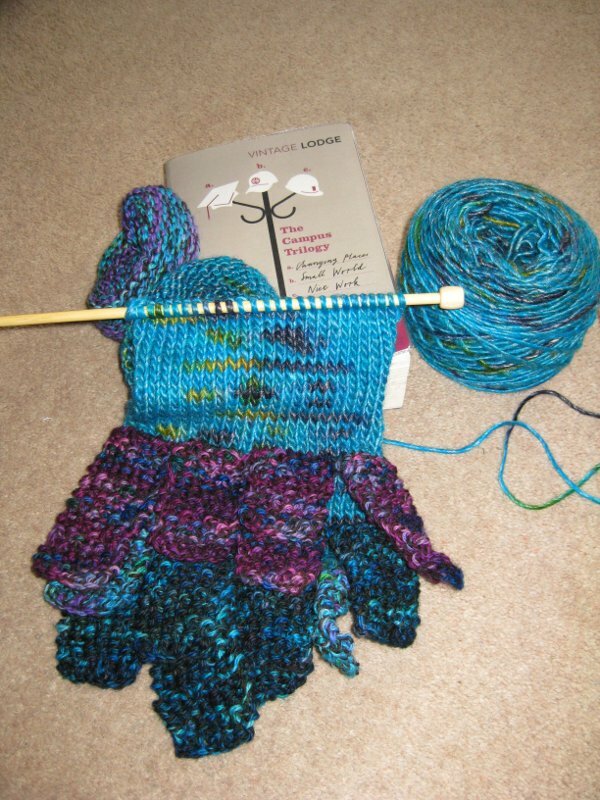 The yarn is from Artist’s Palette Yarns in Herefordshire and was a birthday present from my sister-in-law. I’ve never done beading before and I quite like it. I’ve chosen the unlikely-sounding method of using dental floss (the stuff that has thick and thin sections) to string the beads. It works really well – the thick sections hold the beads in place and you use the thin section to thread through the stitch you are beading, then back through the bead, which can then be pulled down onto the stitch. So simple! I don’t recommend trying it while travelling by train though. It got a bit stressful when I tried. I’m hoping that next week I’ll be able to push on with these and get them done before the Olympics start, although that is looking less and less likely. I’ve not chosen my Ravellenic Games project yet, although I am signed up to Team GB. 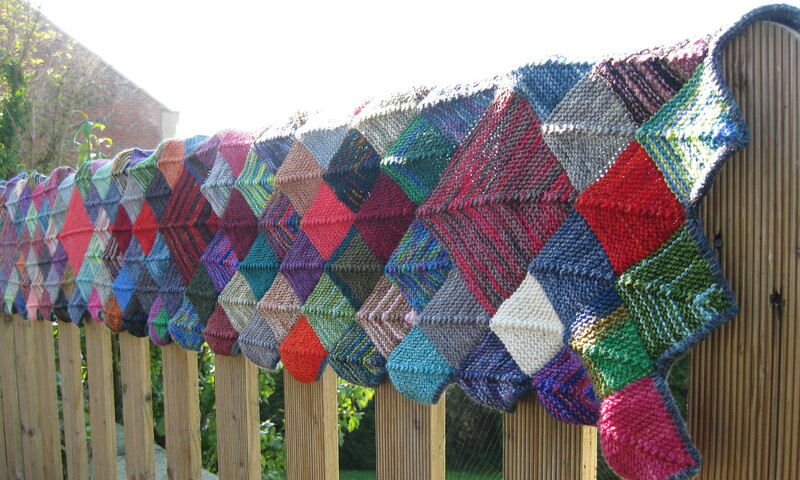 I may do some more squares on my sock-yarn scraps shawl/scarf as a starter, but I’m not sure what else.